Mobile version of the website - why are the Google? more than 1.2 billion. people reach websites with their smart phones. Such statistics are based on 2015. Google allows updates to the site adaptability, using mobile, check. These led to updates of websites owners to pay more attention to their application in mobile, because it was one of the search engine ranking factors. Going mobile - the gadget? Adaptive design - convenience to access the site via mobile phone. Site user opens the mobile phone browser to surf it convenient, easy to access all the necessary sections to read the desired information, order goods and pay for them. Gadget - is quite another. It is the user can install on your phone, and easier access to the site. or the applet will be more convenient for the user? whether it will provide exceptional value? What is the social value? whether the gadget will call that are not on the site? whether there will be entertainment? If these questions answered yes, then you need the gadget. If not - you absolutely enough well-functioning and optimized mobile Website. Why do you need to focus on Mobile Search? Previously it was thought that a smartphone is used only in case of urgency. Now attitudes are changing. The smartphone is available just fine tool, which is convenient to look for information anytime, anywhere - at home, at work, on the road. This - quick - search is particularly useful for local businesses, because more often to search, for example, a nearby restaurant or shop, and soon there come in. In terms of mobile usage habits, it should be noted that the mobile phone - usually means more personal than a computer, because a computer can be shared with other family members. Thus, the information in the smartphone - more accurate, more consistent with the actual user preferences. In addition, the mobile phone can be connected to smart devices, which means that it can be not only the location, social communication, language, but also the state of health information. So mobile phone search system allows you to achieve more than a computer - it becomes more personalized. For users more easily find, such as a restaurant, it is possible not only to provide contacts, but also to create a feature to immediately call a mobile. How should look like a mobile website? mobile search conducted entering shorter keywords, so pay attention to it when writing the descriptions of goods, doing keyword analysis. Usually keyword phrase consists of one or two words. Website buttons should be large enough to be comfortable clicking your fingers. 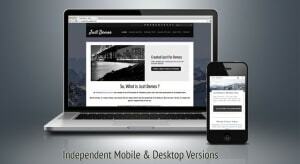 your site should not be too long - a mobile everything easier to find through short menu items. Do not use large pictures, which "cuts off" the text in the middle. Doubts whether the mobile version of the arrangement really is needed? The numbers speak for themselves - trimmed mobile version is often noticeable even 84 percent. greater flow of visitors to the site. For this reason & nbsp; you can be sure that going mobile - it's worth your time to the task. Seo Optimization: Mobile version of the website - why are the Google?